Dear Readers, We have already seen a story to remember important days in January month, Hope you remember the story. Today let us see another story to remember important days which falls in the month of February and March. 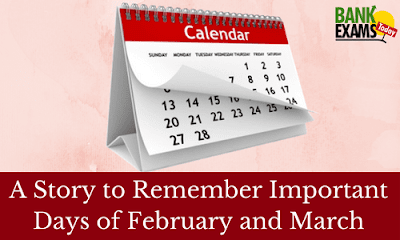 February and March month have nearly 13 important days. I have clubbed these days randomly to frame a story about a sparrow couple. It was a dark and thick forest of Amazon region, where 2 little couple sparrow lived happily. One day the women sparrow was lost. In search of the women sparrow the male sparrow went around the forest by crying. He got thirsty. He drank water in a nearby lake and again started to search his wife. He got fever suddenly so, went to a hospital for treatment. The doctor found out the reason for his sickness by using the thermo(meter logically) and scientifically that he was affected by TB,Kidney stone and the dangerous disease Cancer. The doctor enquired the sparrow about what he ate yesterday. Male sparrow narrated his sad story and said that he drank water in that lake. Doctor realized because of the contaminated water he got these diseases. He felt pity on the sparrow and said that he will get social justice to him, by complaining about the contaminated water to the consumer rights court. He also announced about his missing wife sparrow in the Radio. Finally doctor cured his disease and found out wife sparrow. Again both of them started to live happily in that forest!! After reading this, open your Gmail account, check your inbox for new messages. Next login to your FB account and check for new notifications. Next open our website and just see the topics we uploaded yesterday. Let us see how many of you can complete this test perfectly!! !